From the sound of the title, I probably sound like a sports fan. I’m not. I know nothing about football, baseball, or basketball. I am incredibly annoying when sports are on TV because I either a) fidget b) ask questions. So when a friend of mine decided to host a game day party, I offered to prepare the food (much more entertaining). The idea of making game day food healthy is a side project that I am interested in (which unfortunately is on hold, but learn more here and here). It was a good deal on both ends- my friend had the equivalent of a caterer and I got to use the guests as guinea pigs. As many of you already know, sometimes healthyfying a recipe works and sometimes it doesn’t. Sometimes you need a little butter or cream to make something work and its a matter of figuring out how little will still bring a yummy result. So here we have Game Day Appetizers. I loosely followed the recipe found at Framed. I kept the quantity of butternut squash, onions, and garlic the same and I sprayed with olive oil spray. Once I was working in the food processor, I did not add any additional olive oil and I substituted 3 tbsp of sour cream for about 1/2 cup of non-fat greek yogurt. I used a tiny bit of cayenne, some cinnamon, nutmeg, black pepper, and was pretty generous with the salt. The key is to keep tasting as you puree so you don’t go to heavy on the salt. The dip was a success. 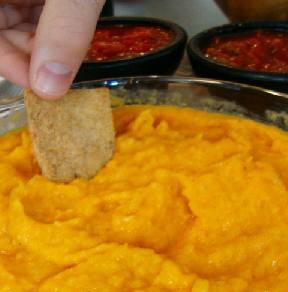 Most people love squash and this dip was a unique way to eat squash. I would recommend making this for any party. Well, they are adorable. I’ll give them that much credit. And, they have potential. But this is an example of when cutting out too much fat goes wrong. I used about 2lbs of 0% fat ground turkey and mixed that with about 1/3 cup of bbq sauce and an array of meat/poultry spices because I knew from past experience the flavor had to come from somewhere and it wasn’t going to be the turkey itself. After kneading the meat, I broke it into quarter sized meatballs and to grill them used cooking spray. Pretty disastrous. There just wasn’t enough fat for the meat not to glue itself to the pan. I cooked them about 80% of the way and then stuck in the oven on broil. After about 2 minutes on each side, I topped each meatball with a small slice of cheese (again using 0% fat cheddar). 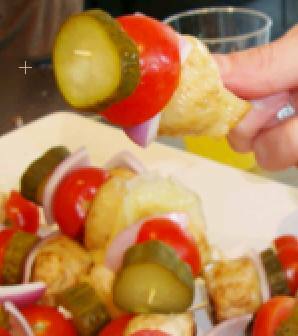 After the meat and cheese cooled, I stuck on a toothpick with red onion, half a cheery tomato, and a pickle. I personally think these would have been significantly better with 93% turkey, but despite my disappointment, all 45 skewers were eaten. Moral of the story – make these, they are cute, use some fat. I love working with Phyllo dough and a variety of mushrooms seasoned with 1 thyme and rosemary is delicious, so the two came together. To make this chop up a variety of mushrooms, spray with olive oil, and on medium heat, cook mushrooms (about 5 cups) with salt (to taste), thyme (1 tsp), and rosemary (1/2 tsp) until everything is soft and fragrant. 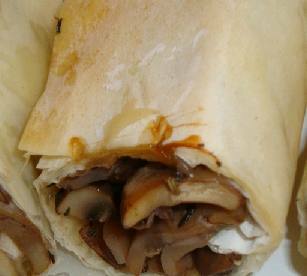 Drain the mushrooms using a strainer to avoid getting the phyllo dough soaked through. Take 4 phyllo sheets per roll and spray lightly with olive oil between each sheet. Take about 1/4 of mixture and lay at the bottom of the sheet. Roll up the mixture and cut into 4 to 5 pieces per roll. Bake at 350 for about 15 minutes, or until phyllo starts to golden. Delicious! If you are ok with adding a little more calories sprinkle mixture with Parmesan cheese before baking. You could make this dish with anything wrapped inside: artichoke and spinach, chicken and sundried tomatoes, etc. Did I mention I liked working with Phyllo? Another super easy recipe. 1 can of black beans and 1 can of corn (low sodium and strained with water). Mix with 1/2 can of medium salsa, 3 tbsp chopped cilantro, and 1/2 red onion finely chopped. Drain for extra liquid to avoid soaking through phyllo cups. 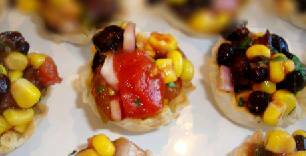 Take mixture and fill phyllo cups (they are so easy to work with, the day you are going to use them you take them out of the freezer, and 3 hours later they are ready to use). Just like the rolls above, you could fill these with anything. I chose the mexican filling to replace the typically unhealthy nachos you find on game day. This healthy version of BBQ pizza is so good that you get the taste you want out of pizza with none of the unhealthy fat. One person commented that if there was a way to get this pizza in a NYC pizzeria, he would be getting it everyday. Recipe can be found at my on-hold-project. Please share any ideas you have for healthy appetizers. I’m already looking for something new! Game Day isn’t something I identify with. I don’t have a favorite team. My moods aren’t affected by scores. However, there are hundreds of millions of people that love being sports fans. Sometimes these people are your friends and they want to come over and watch sports. 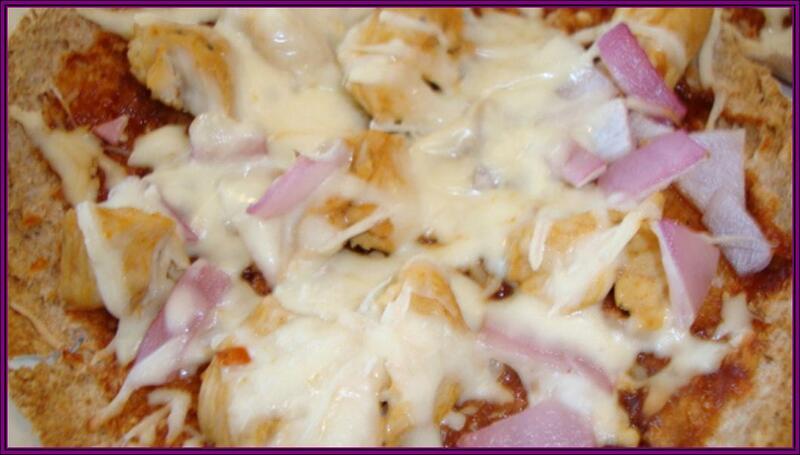 When that happens, here is a great thing to serve: BBQ Chicken Pizza! This recipe is from a series of recipes that were developed for a new site: (Don’t Look Like A Lineman). This site is for the typical guy that loves beer and bar food but not the stomach tire and love-handles that come along with it. There’s thousands of healthy living sites for woman, but not very many practical ones for men. Check it out and please share with your male friends and significant others. Whole Wheat Pita (comes in packs of 8, slice in half, make 16 individual pizzas. Does this sound fancy or complicated? Its not. Not even a little bit. But it is delicious and extremely healthy. The spread takes 20 minutes to put together and the hilarious part is it cost less than $2. I’m not kidding! The sweet potatoes were purchased for $1.30, everything else was in the fridge and needed to be used up. 1.Preheat oven to 425 and stick a baking sheet with parchment paper in so it gets hot while you are preparing the potatoes. 3. Take out baking sheet and spread out sweet potatoes. Bake for about 10 minutes, flip fries, and bake for another 10 minutes. That’s it! As you can see from the picture below we also made guacamole and served with chips and some freshly cut veggies with Sabra Hummus. To drink a bottle of dry white wine from South Africa – 50% sauvignon blanc, 50% chenin blanc (2007 Groote Post, The Old Man’s Blend). The wine was refreshing and crisp, the lemon and lime aroma of the wine was a perfect addition to the lime of the guacamole and the sweet potatoes fries that were also drizzled with a lime. Compliments to my favorite wine store owner for the recommendation!